I will begin this post with a short update that yes, I managed to hurt myself again by just doing nothing. By doing nothing, I mean walking until ultimately having my index finger (on the left hand) sucked by the steel blades of our electric fan. Following another stint in the ER (barely two months after my last stint), I am back…hurt but unscathed saved for a hairline fracture on said finger. Thus, I am typing this using my usual right hand and the thumb from my left hand. Yes, nothing can deter me from blogging. 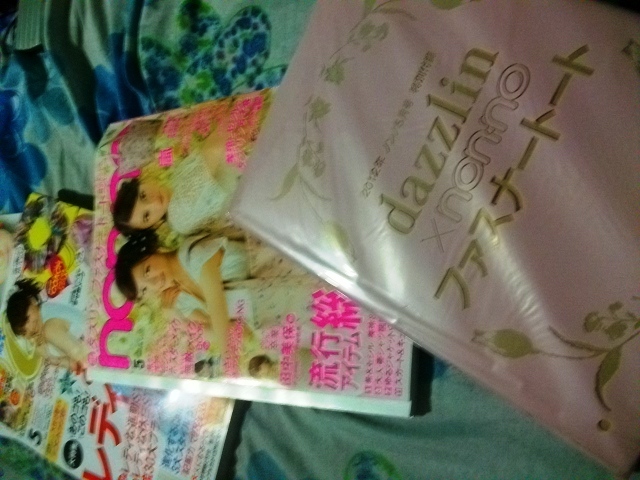 Okay, with the update in place, things started picking up after said ER trip via a short visit to my former office where I picked u my three new magazines, bough fresh from a Japanese convenience store and shipped to the Philippines for my viewing pleasure. 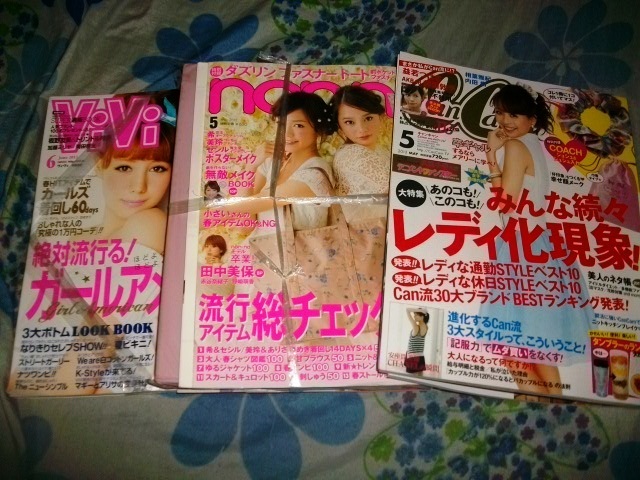 These three have always been my favorite fashion magazines. 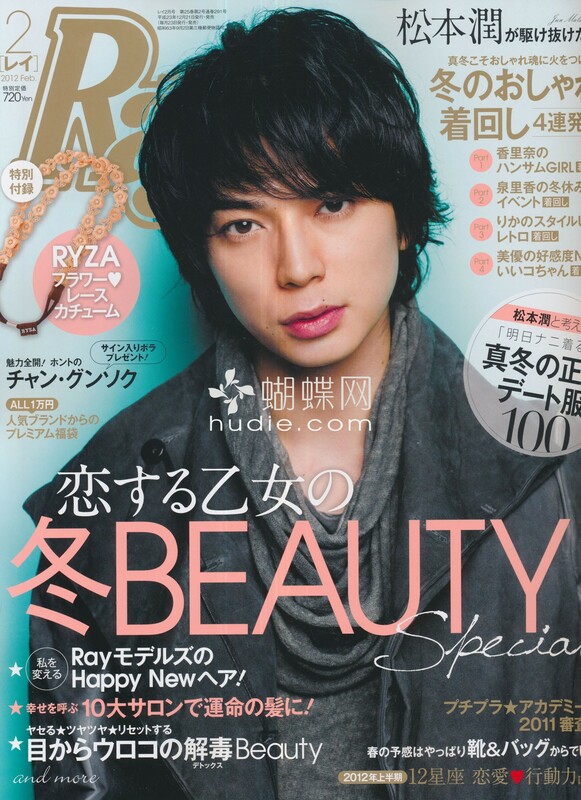 Like I mentioned before, non-no started my love affair with Japanese fashion magazines almost eleven years ago as a rookie reporter for a Japanese newspaper. 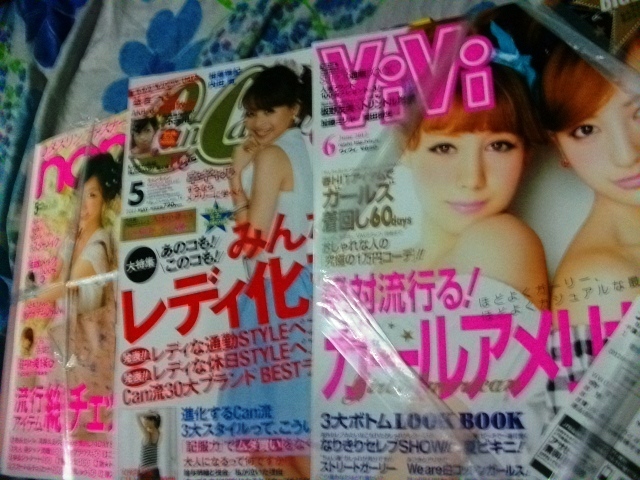 Then, I discovered CanCam and Vivi and never looked back. 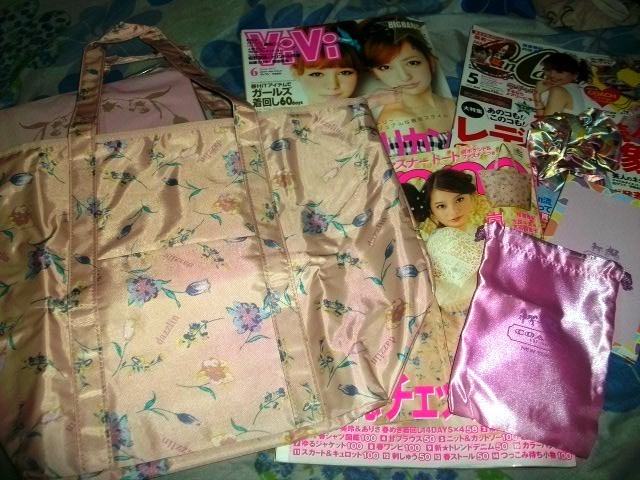 Aside from having insanely cute dresses and shoes and a cute lay-out to boot, the best thing about Japanese fashion magazine is the furuko or freebie stuffs inside. I’ve read somewhere that this has been the strategy of the publishers to further entice the readers into buying the mags. 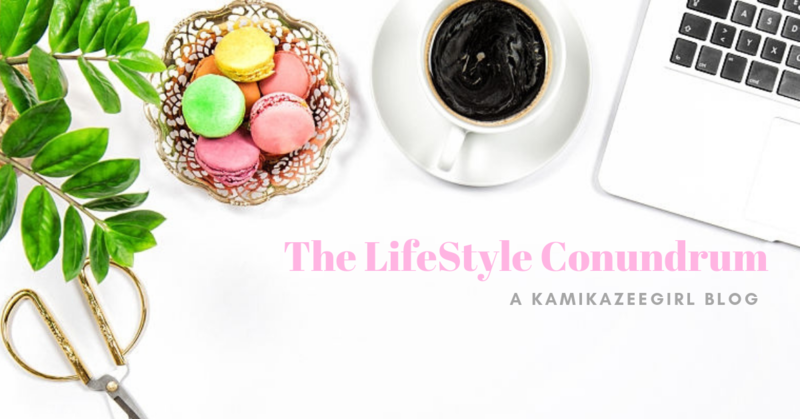 Usually, freebies are these little yet painfully cute items like tote bags, make-up, accessories, pouches, wallet, etc developed in partnership with famous brands catering to that particular mag’s readers. Dazzlin is an adorable clothing line based in Japan. They have this kawaii, playful vibe going in all their collections. 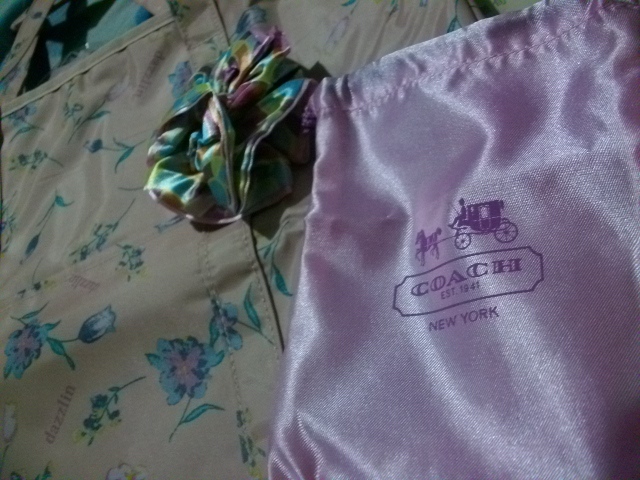 While it looked really cute and girly…I can’t see myself using a hair accessory that…colorful. Quality of the item wasn’t really impressive and for me, it didn’t look like it was well done. …and oh, if you are also a fan of the Jimusho boys, do note that their adorable mugs are plastered on the May issue of non-no. 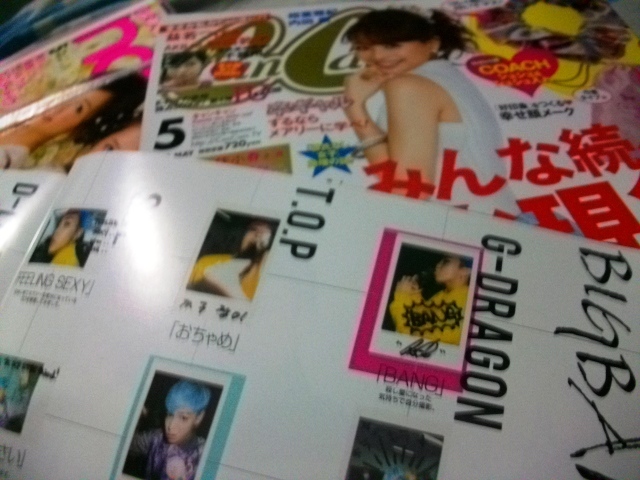 Sakurai and Aiba (Arashi) is featured. As well as the adorkable mug of Toma-chan. Looking forward to getting next month’s issue. How, I haven’t got any idea. Too bad that there’s no Kinokuniya in the Philippines. How can someone be so effin’ good looking? 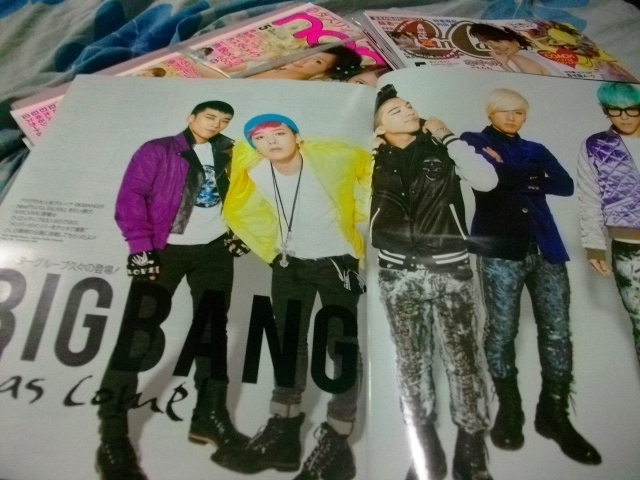 I almost hyper-ventilated when I saw this cover in one of the sites I frequently visit for Japanese fashion magazines. Unfortunately, the link indicated in the site was not working perfectly so had to scour the net just to find this issue. 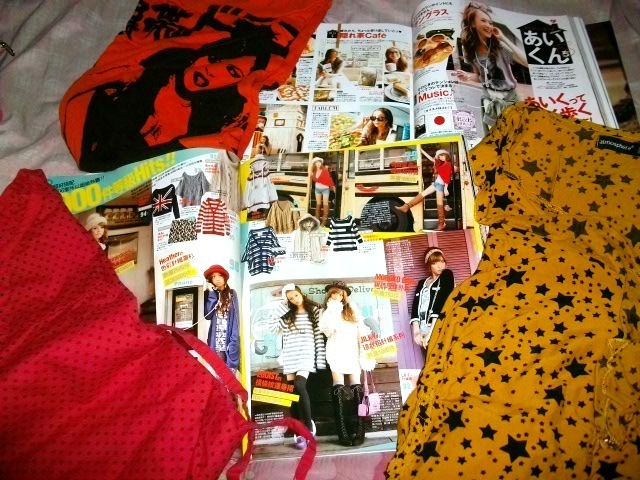 Fortunately, I was able to find this site featuring a chock-ful of Japanese and Korean fashion magazines. 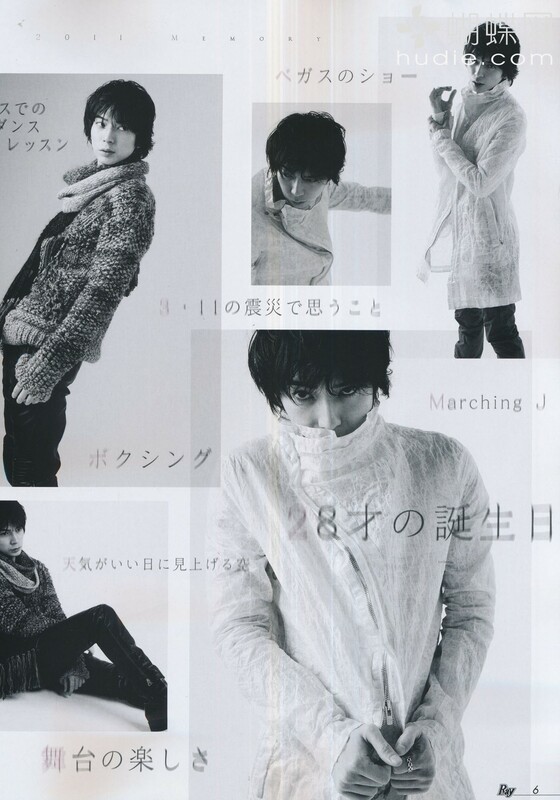 Credit goes to li8htnin8.blogspot.com for the scans. 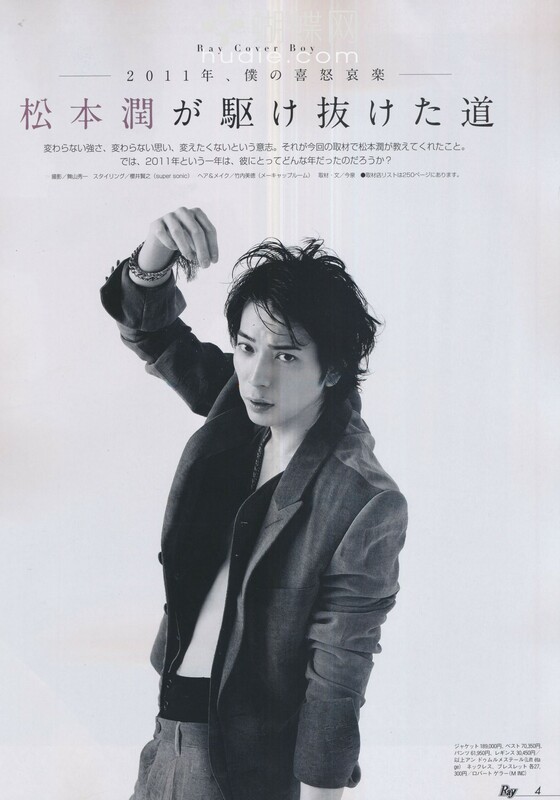 MatsuJun looked more mature nowadys, compared when I first saw him in Gokusen. And it’s been quite a while since I watched a drama featuring MatsuJun. The last one was Smile where he played Hayakawa Bito, a haffu who managed to be optimistic with everything in spite the bad experiences and misfortunes that came his way. This drama drained the life out of me–as I cannot help but shed copious amount of tears in every episode. Very ironic, considering the effin’ title was Smile. I finished all episodes, but it felt like I’ve just been through the most draining emotional experience of my life, and fortunately, I emerged unscathed. 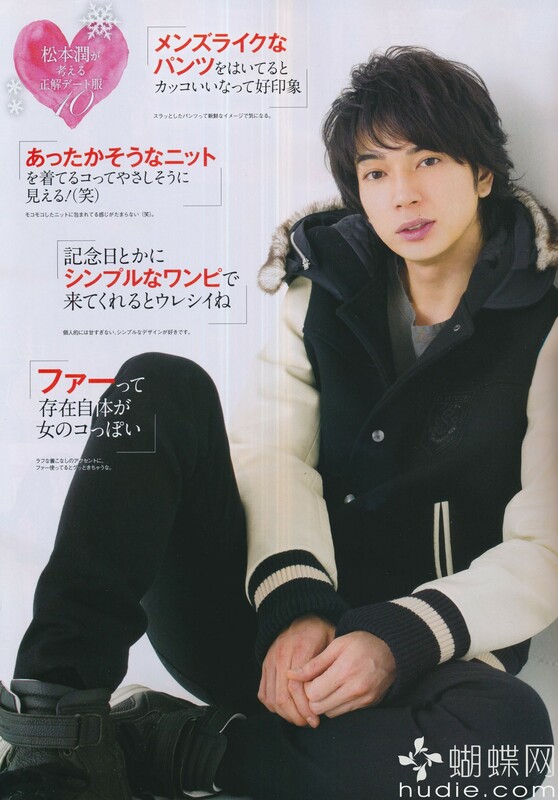 Smile proved that MatsuJun can act, and not be just some cutesy Japanese idol, boy-group extraordinaire. A pretty immense talent to match the perfectly awesome face. Just when I thought the grindhouse is the epitome of “boring” and “without any emotion” at all — a great cheer exploded on the busy and paper-filled floor of my penthouse office. The reason: human resources has declared that Fridays will be–starting tomorrow and every Friday thereafter– will be known as dress down Fridays. With the cheers and the excited chatter that filled up the whole office floor, you would thought that the Queen of England has sent us all letters saying we are now official UK citizens. For a good 15 minutes, I heard my good ol’ (adorable) office mates excitedly discussing what they can wear, if it’s acceptable to wear a slightly frayed jeans (it’s not — frayed, torn, mangled jeans are not allowed, if flat women’s sandals will be acceptable and so on and so forth you would think we are attending New York effin’ Fashion Week. Anyway, I was smiling earlier — listening to the inane chatter, feigning coolness. Fast forward a few hours later and yes, I have all my CanCam, Vivi and Nonno magazines scattered on the bed while I scout for ideas. Yes, this is the highlight of the day. When you lead a predictable 8 to 5 life, don’t even think you have access to excitement and too much action. Life at the Grindhouse is now officially hectic and stressful. I feel like I am doing five things at the same time. Here’s my little pockets of happiness. 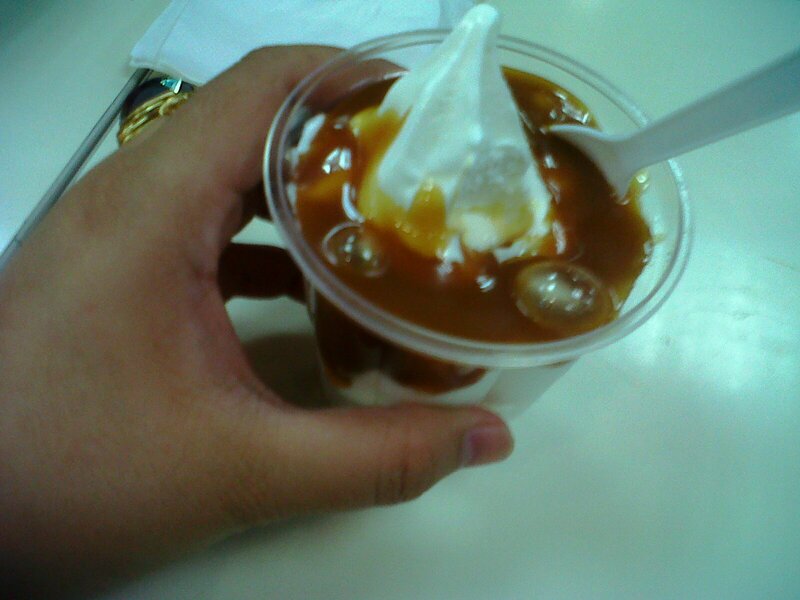 I love McDonald’s Caramel Sundae — it’s the cheap thing that makes an otherwise miserable day especially bearable. My love is such that I barely cared if I am suffering from a bad cold or cough — I will still eat this in a heart beat. My good friend A treated me to a caramel sundae earlier after a particularly harrowing day (for the both of us). The plainness of the vanilla ice cream and the sticky sickly sweet caramel offers a tempting contrast that has a way of melting stressful deadlines and pending deliverable spoon after spoon after spoon. Since I am trying to watch what I eat — I am controlling my junk food intake. I am particularly straying away from chips and chocolates (incidentally, our pantry is overflowing with these two), and is shunning rice for the meantime. I just can’t give-up my kyarameru. I am also shifting through piles and piles of magazine looking for some inspiration on what I can wear to work tomorrow. Sometimes, I tell myself that it’s hard keeping up with your own expectations.